The film is somehow disappointing perhaps because the trailer marketed a different focus for the narrative. You must admit, that trailer gave you the creeps. This weird tradition of taking pictures of the dead posing as if they were still alive is plain freaky. Of course, we cannot really judge the customs of an entire nation, and what is scary to us might have a totally different, perhaps even sacred, meaning for them. The movie capitalizes on that and the premise revolves around it. And then you realize that there will be soul transfers involved, possession, and all that cliché The Exorcist inspired formula that is just so passé by now. 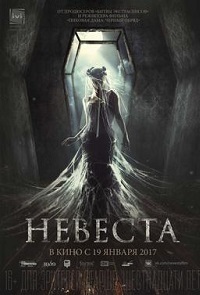 This is Невеста’s disadvantage, because a story based on haunted post-mortem photography seems more sinister and horrifying, if only they concentrated on that instead. The issue with the main villain is all about what her intentions are. Why is she back for revenge? Who is the object of her revenge? Is she just malevolent for the sake of being so? Is the spirit involved here the dead bride or the kidnapped virgin? Both? These details are left out in the story, or if they are indeed there, you are going to have to piece together the clues on your own. Simply put, her motivations are vague and not that convincing, as if evil spirits needed a justifiable reason to haunt you. Whatever. It does not help that the plot development is slow and totally predictable. You can already smell the ending from a mile away, and of course that cliffhanger in the end is conveniently placed there in case the film rakes in the cash and a sequel can be milked of more rubles. The penultimate act is a literal dark mess, so chaotic you just sit there wishing that the torture would end soon. Watching the characters do what they are supposed to do at such a dragging pace can be quite a bore, but then again you stay put to confirm your speculations anyway. The film has its moments of brilliance. The doppelganger scenes are as spooky as they are confusing. The old house itself commands attention due to its mysterious ambiance. The movie will give you a good jolt once or twice, but the jump scare technique can only do so much. A good thriller nowadays must get in your head and mess around a bit. Невеста fails to reach that level, unfortunately. One possible way of enjoying the film is to look at it as one big dysfunctional family drama, but this will only work if the family relationships are exploited to full potential. It requires a great deal of empathy from your audience in order to invest their emotions on the characters. Such expectation is a tall order when the characters are hardly relatable. In the absence of such connection, you wouldn’t really give a damn whatever happens to these doomed lovers, or anyone related to them for that matter. In the end, I would have appreciated the film more if the version played in cinemas here wasn’t dubbed in English. Maybe hearing the dialogues in the original Russian would have been more enchanting to some extent, or at least distracting enough to hide the paper-thin plot. Невеста will still give you a good scare for half an hour or so, but just don’t expect to be wowed.